Albino Deer. These deer are typically identified by their pink nose and eyes–the result of blood vessels showing through the skin and clear lens of the eyes. 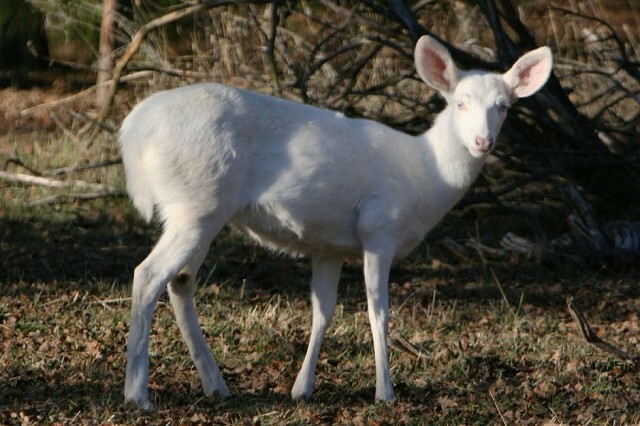 Albino deer are similar to other deer, except that their cells are unable to produce melanin, the dark pigment that causes normal coloration in the skin, eyes or fur. A lack of melanin usually causes a deer (or some parts of the deer) to appear white or pink, or to have a bleached look.